When it comes to choosing a dentist in Eagan, the choice should already be clear. Denmark Dental has been proudly serving our community for more than 40 years. But what’s the secret to our lasting success? It’s because we’ve remained an independent dentist during that time. We understand that there are many corporate-owned dentists in the Eagan area, but we feel that the level of care and service you’re offered at our independent dental clinic is superior for a variety of reasons. Not convinced? Here are the reasons you should visit an independent dentist in Eagan. In a tight-knit community like Eagan, it’s important for your dentist to know you as a person first and a patient second. As independent dentists, we’re excited to get to know you better over the course of your visits to our office. We recognize that you could be our neighbors, that we share the same roads and grocery stores. That’s why we want you to feel comfortable with us in and out of the dentist’s chair. We can build lasting relationships with you and your family because we’re invested in your long-term oral health. As independent dentists, we’re able to bring our complete complement of skills and knowledge to each one of your appointments. It also means that we can specialize in certain treatments and procedures that other dentists in Eagan might not. This means we can better care for you and your smile. For instance, at Denmark Dental, we specialize in addressing TMJ and TMD issues. Treating the temporomandibular joint or other temporomandibular disorders can be a complicated process, but thanks to our skill and expertise, we make it easy to address these concerns! At the end of the day, working with an independent dentist is an investment in your long-term oral health. No two smiles are alike, so we can develop a care plan that works best for your needs and your budget. We’ll work with you to create a clear understanding of what your unique dental needs are and keep you informed of treatment options that keep your smile looking its best. As you develop a lasting relationship with us, we can better plan for your oral healthcare needs as you grow, and we can address any dental needs as they arrive. Working with a consistent dentist means you never have to transfer charts and records, and you’re always meeting the same provider. Since your smile is a mark of our work, we’re excited to put our talents to use to make it gleam and shine. 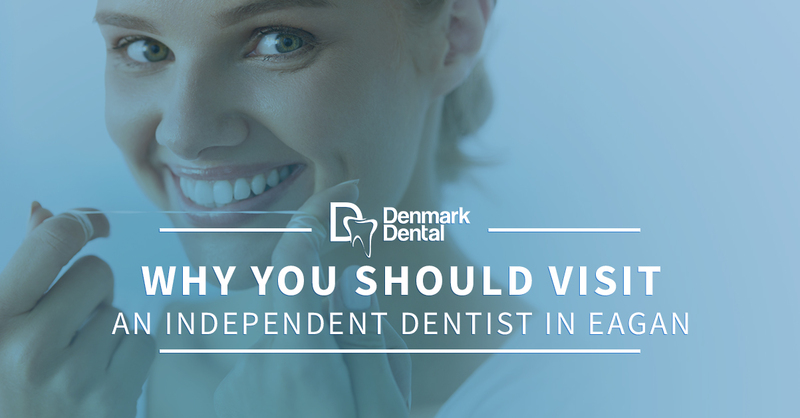 Denmark Dental is the region’s experts in cosmetic dentistry. With more than 40 years of experience, our team is committed to offering you the quality dental care you deserve. We use the latest techniques and innovations in the dental field to offer services like fillings, crowns, and tooth whitening, as well as procedures like root canals and implants. If you’re looking for an independent dentist in Eagan, give us a call today. We’re happy to set up an appointment with you!